You are at:Home»Features»Commentary»It’s Training Time! Training is the real litmus test for ultrarunners, because you simply can’t do this sport without putting in tons of miles over several months. Progress is measured in slow increments, and you won’t really know if all the effort is paying off until months later at the finish line of a big race. Real ultrarunners relish the training phase and sink in deep. Hard work in pursuit of goals and dreams gives focus and meaning to life that are invigorating and affirming unlike anything else. I’ve been training all year, but with little tangible payoff so far in terms of fitness, speed or endurance. Most stubborn has been my “elevated and not declining” physical mass. Just when I was starting to pout and wonder if the sport was leaving me by the trailside, I learned that 2014 Ultrarunner of the Year #4 Dylan Bowman summited 2,500-foot Mount Tamalpais 100 times last year as part of his training regimen. And he makes it sound like fun. That was a wake-up call for me—young, super-fast elite ultrarunners aren’t just born that way. Sure they chose their parents well, but they also work and train extremely hard. So I’ve turned my training up a few notches and am getting after it in bigger and newer ways. This issue of UltraRunning is packed with things to help your training. In fact, our Nutrition column inspired my fat-burning 20-miler. As did Ian Sharman’s column about having a specific purpose for every run. 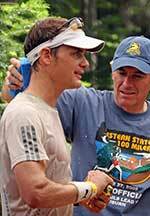 Scotty Mills, who earned the 2014 age group performance of the year at Hardrock, shares the secrets that have kept him running ultras for over 35 years, including 17 silver buckles at the Western States 100—many of those while sharing the trail with Ann Trason, who dishes up great hill training insights in Ask Ann. And don’t miss Ellie’s discussion of the emergence of ultra coaches, or Matt Flaherty’s article on the growth of running camps. And Gary Dudney tackles the challenges of ultra training in his insightful Running Wise column, but if your training really has you in a funk, just check out Zach Adams’ article on how to avoid burnout on page 79. If all else fails, just remember that the act of running is an amazing gift that takes us to special places—physically and mentally. May your every run be a great one! Great warm-up to the new issue, Karl. Can’t wait to read it. I’ve gone as far as 14 without fuel. Next up 20, I guess.